By Rob Jackson: As Corflu Fifty administrators, Rich Coad and I are delighted to announce that Geri Sullivan has accepted the group’s nomination to travel to Tynecon III: The Corflu in Newcastle in March next year. 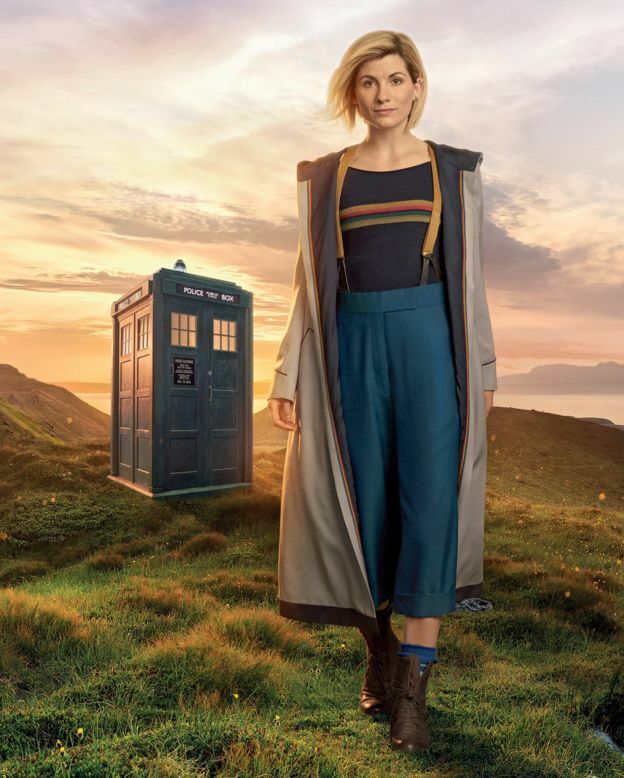 (She not only said yes, but Rich says she said “Yes, yes, yes, yes, yes, oh my god, yes!”) The con committee have already decided she will be given free membership of the convention, but other details will be announced later. Corflu Fifty members are invited to support the fund in the usual way $25 or £15, or whatever extra you would like to give – and those who are not members of the Corflu Fifty are cordially invited either to join (so you can help choose future nominees, of course), or to contribute to support Geri’s trip this coming year. If you would like to join or contribute, please get in touch with Rich or me for details. Mail checks made out to Rich Coad, at 2132 Berkeley Drive, Santa Rosa, CA 95401; or PayPal to richcoad@gmail.com (I think if you say it’s a gift and personal there is no fee). For UK contributions, either by old-fashioned cheque posted to me, Rob Jackson, at Chinthay, Nightingale Lane, Hambrook, Chichester, West Sussex PO18 8UH, or by PayPal to jacksonshambrook@uwclub.net, (friends and family, I think you call it). 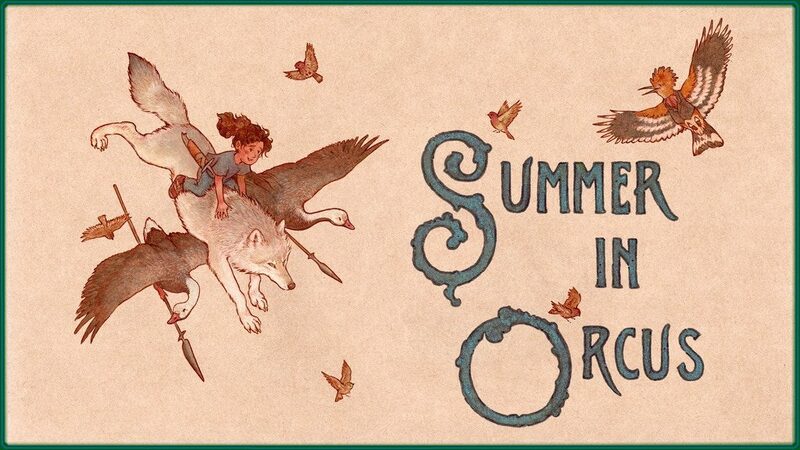 By Taral Wayne: It had gotten so difficult for me to get to SFContario that, when November rolled around and it was time for the third year’s con, I had decided not to attend. My plans were thwarted, however, by the announcement that Chris Garcia was the Fan Guest of Honour in 2012. I had always wanted an opportunity to spend some time with Chris, since both times I’ve met him it was impossible to make him sit still long enough to talk to. So, I went to SFC anyway, despite expecting to have a thoroughly miserable time. In fact, I did have a thoroughly miserable time … but it was the travel to and from the convention that was the source of it. Two hours each way, with three connections. By day the traffic getting downtown was impossible. The driver actually warned the passengers, still quite some distance from the subway entrance, that progress would be so slow and that we might prefer to get out and walk the rest of the way! All in all, I spent one hour in transit for every one I was at the con. Under the circumstances, I think you’ll understand why I skipped Sunday. Anyway, people customarily leave early Sunday, and all I was likely to miss was the dead dog. Compared to the prospect of a long sleep, and no public transit, there was no doubt in my mind I made the right decision. For the first two years, I felt SFContario was a little too small and maybe a bit pokey, but this year I enjoyed myself virtually every moment. Whether that’s entirely because the con had reached critical mass or not, I’m not sure. Partly, I may just have been in a more receptive mood. But I felt welcomed from the start, recognized more faces and found more things to say to them. I ran into one of the guests, Jon Singer, almost immediately and caught up with many, many years since we had last seen each another. I had arrived late enough to miss all the programming, thankfully, and could ease into partying mode right away. Saturday was much the same. I arrived late, in spite of trying to arrive earlier. But among other delays, that day there was a police incident on the streetcar. I barely walked into the con in time for my scheduled program event at 6. The panel was on fanzines and fanzine writing, and the other participants were Chris Garcia (the moderator), Neil Jamieson-Williams and myself. Colin Hinz joined us late, after the panel began. The audience wasn’t large, but it was attentive and friendly, which is half the battle. When I posted photos on Facebook that night, I described Chris as “The Wild Man of Fandom” — which is too self-evident to need explanation. Neil I described as the “Punk Academic of Fandom,” which does need explanation. Neil is a sociologist who feels a duty to describe fandom to itself in ways that make anthropologists happy, using words like “matriliteral,” “polyfrenetic,” and “diverse etherealcentrism,” which mean little more than we already know about ourselves but are vastly more educated. But he also publishes a fanzine using a type font that literally cannot be read, and consciously rejecting any illustration or layout tricks that would make the experience of reading “Swill” more pleasurable – a “punk” attitude if ever there was. I captioned myself in the photo as “Supreme Being of Fandom,” a truism you need not question. Since Colin came late, he wasn’t in the shot and has no caption. I thought the panel was more successful than most I’ve been on. We seemed to know what we wanted to say, said it, didn’t repeat each other, but avoided name-calling and fisticuffs throughout. Afterward, the audience had a few questions that we did our best to answer. Someone else will have to write about the other programming. I believe there was some. Arriving as late as I did, I never saw the artshow or dealers room either, though the program book assures me that SFContario had one of each. For me, it was once again party time. 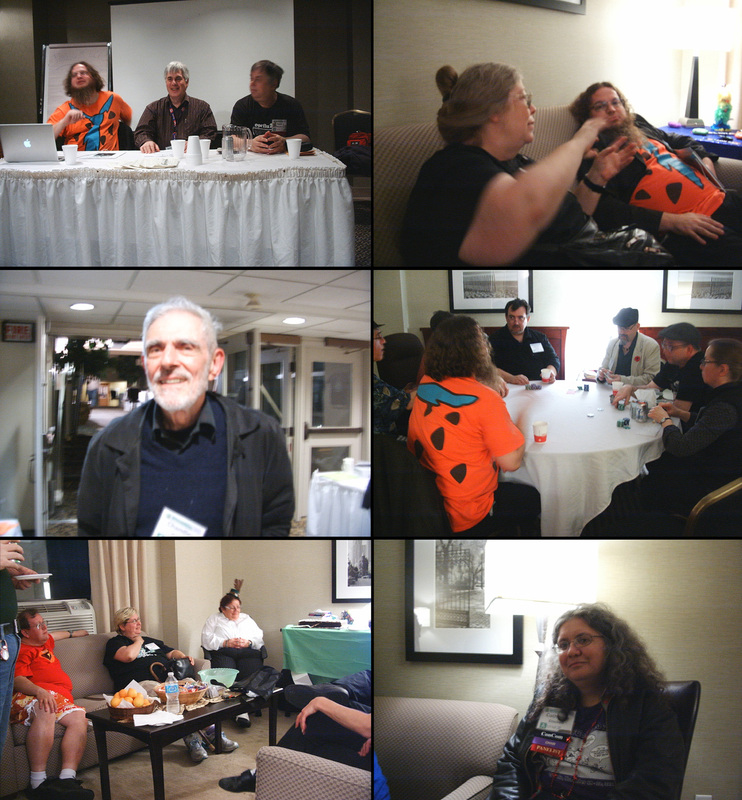 Highlights among the parties were the Detroit NASFiC bid, the Kansas City in 2016 and Spokane in 2015 Worldcon bids, the birthday bash for Yvonne Penney and the festivities in Robert J. Sawyer’s room (both nights). Also notable, but not for everyone, was the Mike Glicksohn Memorial poker game. 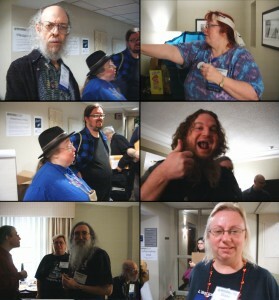 I found Chris Garcia, David Clink (a poet), Carolyn Clink (rob Sawyer’s wife) and several others deeply immersed in their poker faces when I arrived to take a picture. Okay … in reality they were laughing and gesticulating like madmen, and I didn’t see a poker face among them. For me, the highlight of the con was Saturday night, when I bought a funny hat from the Kansas City bid people. It was a dapper little number in black and pinstripes just like Sammy Davis Jr. used to wear, and was supposed to remind one of gangsters in the 1920s. It was too modern for that – real gangsters in the Roaring ‘20s wore snap-brimmed Fedoras, or even Derbies. I was able to convince myself I wouldn’t look too silly in one, though and since I had sold a small number of my CD-ROMs, I felt I could afford an extravagance that weekend. Also, Diane Lacey had brought my Hugo pin to give me. At last, I had all eleven! This year Geri Sullivan ran the con suite and was present almost around the clock. She did step out at least once, and when she returned I collapsed at her feet and whimpered something like “Where were you, I had to fill the coffee machine with water myself” … which she seemed to find excruciatingly funny for some reason. Geri had had bought about 6 flavours of gourmet potato chips and a Canadian cheese to put out. There was hot pulled pork, candies and soft drinks as well, keeping everyone well fed. Unlike some cons I remember, there didn’t seem to be a mass exodus of fans from the hotel around dinner time, leaving a few broke unfortunates or alienated loners behind. This was a good thing, as I am both kinds of fan. 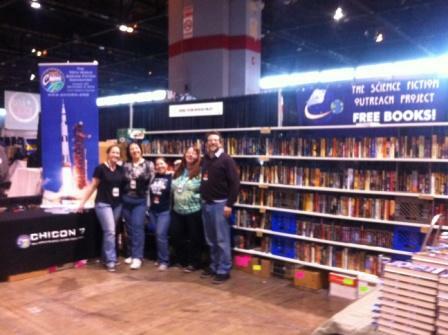 By James Bacon: With support from Baen, Tor, Penguin as well as fans from as far afield as Arizona, California and Boston, the Science Fiction Outreach Project had a massive boost from Midwest fans and now has over 5,700 books to give away! Financial support has been amazing from within fandom and so we are all set up here at the Chicago Comic and Entertainment Expo (C2E2), for a busy weekend. All books have a bookmark, listing websites of all the amazing supporters and we are hoping for a busy weekend. SFContario will gather sf fans in downtown Toronto over the November 19-21 weekend in 2010 for a “big tent” type of convention offering guests of honor Michael Swanwick, author of Bones of the Earth and winner of five Hugo awards; Karen Linsley, writer and performer of the Mars Society anthem “Pioneers of Mars”; Patrick and Teresa Nielsen Hayden; and Geri Sullivan.